Goals: To reduce water use and have an ecological toilet. 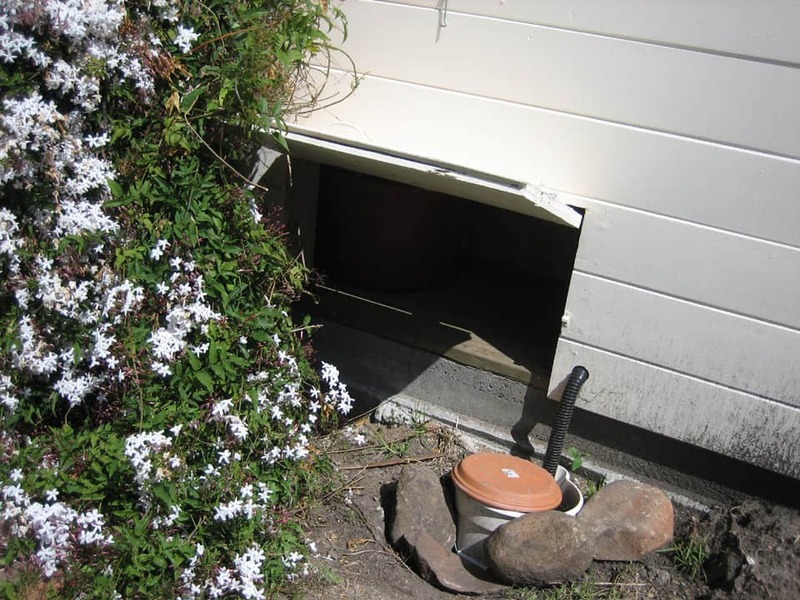 Site description: The backroom of a house was being rebuilt due to rotten beams. The compost toilet was planned out in the remodel. The room is on the first floor with a crawl space and access hatch below the bathroom. 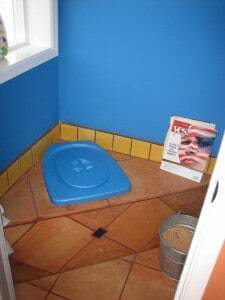 Cost: Urine diverting toilet seat- $120, tile- $50 (left over from old project), poop container- $10, urine- salvaged $1, wood – $50. Total cost for toilet: $230 not including labor. The toilet has a urine diverter insert that separates the urine from feces. This dramatically reduces odor from the toilet, and makes the composting process much simpler. The bathroom is very small so the toilet was built into the corner of the room. After each deposit, a scoop full of wood shavings are added (in silver pail). They come from a local woodworker who uses untreated wood. Toilet paper is added to the toilet and composts fully. 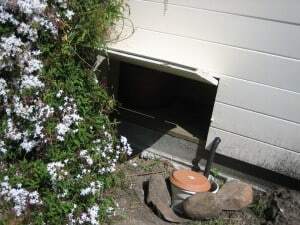 Below the toilet is a hatch. On the right side is the urine tube, it fills a bucket. The urine is diluted 3:1 (water to urine) and used to fertilize the yard. The feces collection bucket is directly below the toilet. The area is sealed off from flies and odor. Note the vent above the bucket. The vent for the toilet travels up to the roof of the house. This is a passive vented system. An electric fan could be added in the future if the system needed more ventilation. Everyone has to sit down to use the toilet, if men want to stand to urinate a simple urinal could be installed sending urine directly into the outside container. 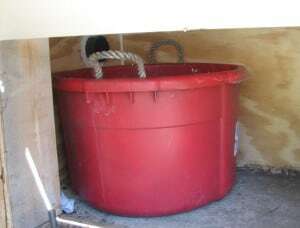 The red feces container is emptied twice a month into a larger, enclosed “feces only” compost container. The feces compost in this container for a full year before they are used into the landscape. The urine bucket is emptied as needed and diluted with water to fertilize.